We have worked tirelessly for the past few months and are beyond excited to finally let you in on all the amazing artists who are making their way on Nov 16-17 for the second edition of Disrupt at Famous Studios. 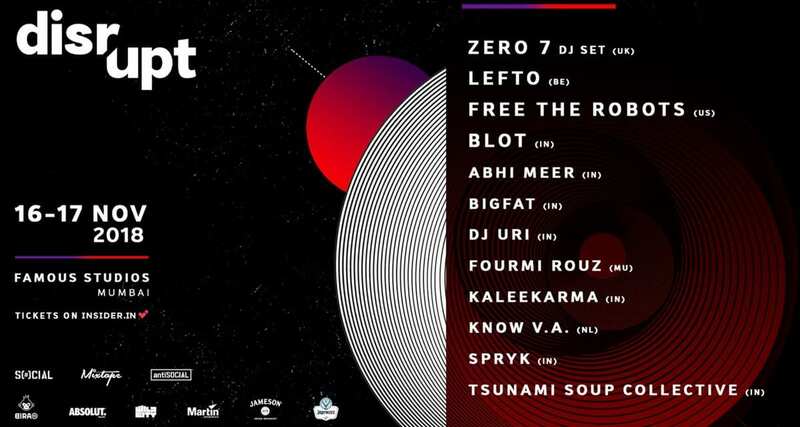 Headlining Disrupt 2018 is British electronic act, Zero 7 playing a DJ set, one of Europe’s finest tastemakers, LEFTO, and India’s favourite DJ and producer BLOT. Joining the headliners is Mumbai-based music producer Spryk, and local stalwarts, DJ Uri, Abhi Meer, Kaleekarma, and bigfat alongside Amsterdam-based experimental duo Know V.A., Mauritian curator Fourmi Rouz and Goa-based Tsunami Soup Collective.